This application may require internet connectivity and subsequent data transfer charges may apply. This game may include: - Direct links to social networking websites that are intended for an audience over the age of 13. 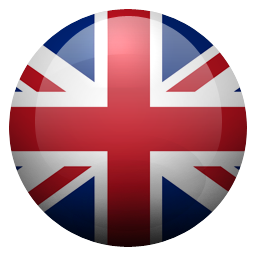 - Direct links to the internet that can take players away from the game with the potential to browse any web page. - Advertising of Rovio products and also products from select partners. - The option to make in-app purchases. The bill payer should always be consulted beforehand. I played this game years ago and absolutely loved it. I was actually to do. I eventually stopped playing and moved on. Years later, I downloaded for my daughter and I was really quite sad about what I discovered. 1. It’s just an advertising platform. Enter a level - watch a video. Access a new area - watch a video. Finished a level - watch a video. 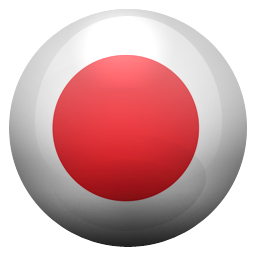 Extend the game - watch a video. Get a booster to complete things easier - watch a video. I’d be better off rating the ads as you spend more time looking at those than the game. 2. Access to levels depends on the success completion of the previous. Fair enough. Access to all previously accessible zones denied.... drip fed access to a new one every 24 hours as long as you watch a video. Not cool. 3. Previously paid for the mighty eagle. Couldn’t use it. Discovered that it could be restored through completion of levels. Fair enough. Levels complete. Restore button crashes the app. Funny that, especially when the ‘buy’ button appears to work perfectly well. Destruction: not yet 100% but getting there. Not the game I payed for years ago! It’s now crammed with ads and in app purchases now, I just gave up on it. Angry birds make angry gamers. On iphone and tablet this game is just so crap needs facelift like 2. It crashes every 5-10 minutes and like resets a hour bk in the past my progress, even after updates etc, its terrible none of the othr games do it. I might just get rid, WHY DONT YOU MERGE ALL OF THEM FOR THE DIEHARD FANS OF ANGRY BIRDS, it would help with being signed in on facebook for a start, cant fault angry birds 2. Absolute brilliance. Merge its predecessor and make it outstanding.like on 2 you have the list of items to do on the right, do that, but just do summert ffs. Good game when not dodging adverts!!! Would still give 5 stars if it wasn’t for all the advertising, sure this has made enough money not to need adverts every 5 mins!!!! Came back to this after years away. WOW, HOT MESS. Awful now. This game is an undisputed classic, with excellent focus on gameplay, and a simple graphics engine. I’d love to see some more story though. Still amazing, even 10 years later. Dont download this. Not even the classic. I dont what they done to this game but when I played it, the game is all modded and all these powerups not even the game that we all loved. Why so much ad? Also, you cant even feel the nostalgia because what they did to the game. BRING BACK THE ACTUAL CLASSIC! 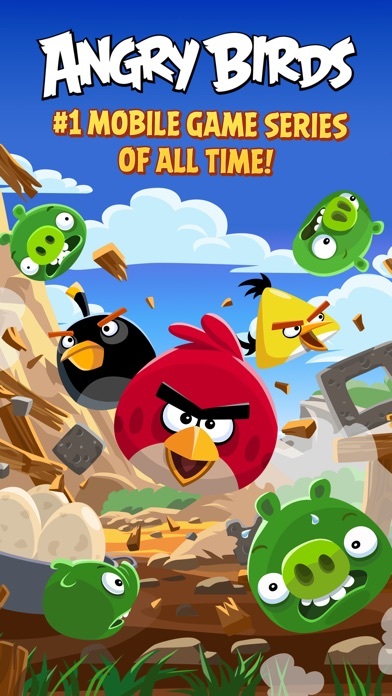 This game is proof that Rovio has no respect for the original which brought them such fame and fortune. It’s still the same fundamental concept except adverts, a currency system and weird user assists have been shoehorned in. These additions massively devalue the experience and make it clear that the developers would rather you spend some money on their other more profitable products. The silly and whimsical game is still there underneath with all the original levels and more, but it gets two stars until it is restored to a true replica of the original. Too many adverts, micro transactions, cost to progress to the next level by "spending" stars earned during play. And it crashed wiping out all progress. I used to enjoy this game. Changing it to use stars to unlock levels is really frustrating. Just trying to get three stars on a level was hard enough but now to progress you need to use star. Deleting the game, really disappointed in the direction it’s gone. Intrusive adverts, inducements to buy upgrades, power ups, extra birds, eggs, on and on. It’s hard to work out how to just play the game! Used to love this - deleted and reloaded so I could start from scratch again; but it’s been ruined bY greed - I will not watch the adverts, so goodbye! Can no longer log into the mighty league. I think Rovio has given up on this game. I think the fact that it says “copyright Angry birds 2009-2017” on the log in page is a big clue. Not 2018?? If you want a cheat to get 7 free shockwave bombs then simply go to the Bird Island level and play games 1,6,10,11,15,16 and 21 and you will see them hidden. Usually you can do this everyday so keep going back to it. Saves you having to buy them. I don’t know what you thought you fixed, but now the app closes when you try to play Mighty League. The game makes you think. And in real life if you were trying to shoot a bow and arow this game would help you. 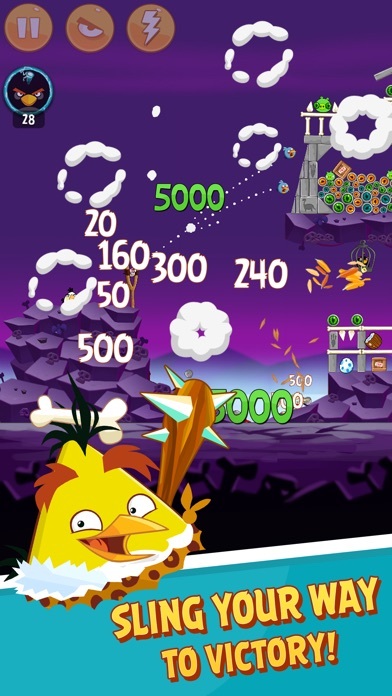 Rovio should be ashamed of how they have taken the best game for IOS, and turned it into a farce. Their selfish greed at spoiling the entertainment provided by the original game is quite astounding. I enjoyed playing the mighty leagues. Despite all the adverts! However previously it kept freezing but now will not load at all on iPad or iPhone. Please sort this out before I delete the app completely. I paid for this game, yet still have to watch a million adverts!!! Deleted app in 15 mins. Loved the original but this is an advertising vehicle. Some ads run for 30s between games meaning you have to put the phone down and come back when the advert has finished. Would pay to get the original game without ads, 'features', 'enhancements' or in-app purchases. Read the other comments to find out more atrocious greedy elements added to this game, but I’m leaving this review just to say you have to watch adverts to unlock levels. I’m done. Don’t download, this IS NOT angry birds classic. Downloaded so kids could enjoy a game I used to love. You’ve ruined it. Not cool. I have had my iPhone X for a year now, and still angry birds is not optimised for full screen! Why! Still waiting for a answer?? I can’t play and open any futures as game constantly crashing. Waist of time and money!!! Updated Amount of advertising is ridiculous right now! As apple user, when I downloaded I HAVE PAID FOR THAT GAME! And now I have been forced to watch all that crap! I purchased this many moons ago and remember it to be an easy going game and I paid for it as well. Re-downloaded today and it’s just advert after advert. Gave up after 5 minutes of silly adverts. I won’t be downloading any game for rovio anymore. This game feels like a scam because every single time I should use any power ups the game freezes and means I have to waist coins on replacements. The app feels like a stupid scam and if not they need to fix it. Downloaded again after many years of not playing with high hopes. After installing it, I was hoping to carry on my progress but this didn't happen. I was disappointed but I thought I’d work trough the levels, as I did really enjoy the game. I didnt get past the second level before deleting the game! Too much is happening... take it back to the original days. Get rid of the ads, stop all the silly power ups and just go back to how it was. I bought Angry Birds when it was first released for £0.59. It was brilliant. Sadly now despite having paid the asking price the app has forced 30 second ads after the first level. Forced ads = deleted app. Very poor. I have loved the Angry bird series and I try to collect one of every type of Angry birds plush. I used to play this non-stop when it first came out so decided to revisit. What a disappointment. Same great game made a thousand times worse by all the ads. Never again Rovio. Too many unskippable video ads... and no visible way to get rid of them. I would pay to be able to play without video ads. What a shame. Not playable in current state. OMG guys you really need to sort the code issues out on this one. The amount of times this game crashes is insane. I love the game, but the Mighty League is just not playable most the time. I have lost sooo many power ups and stuff. However it seems as though the Episodes part works find but the might league is far from mighty. I am Software Tester myself, and there is no way I would have allowed the game to be released without being properly tested. You’re going to loose so many fans if this isn’t sorted, so please, please sort it out. I loved this game but it’s blighted with adverts every few minutes. I have to delete it. Very frustrating- it was a fantastic game once upon a time. Used to be a great game, saw it updated and thought would give it a go! Ad’s at every opportunity now, has it been released like this originally you could be sure they wouldn’t have got a movie out of it! Once such a great experience, not anymore. I agree with Glendinning1989, the adverts are so intrusive it’s almost like I’m watching adverts and this little game keeps popping up wanting me to play! LEAVE us alone little piggies we are watching adverts!!!! Absolutely pathetic amount of interruptions from adverts plus when you first load up the game the timing for their own advert to get you to click on it is amazing, just when your mind reads the screen and you want to push one of the 2 icons it throws the big screen advert up, conning you into touching their advert and being shoved in their part of the world. If I pay for a game I want it to be advert free, I expect adverts in a free game not a paid game. I hope someone in their company reads this but every time I want to play this game if the advert kicks in within 2 plays I close the game, I don’t care what advert it is it just makes me not ever want to go to it because if I do then your adverts prove they are there for sales, never from me. You can keep all your other angry birds on the app stores because if I ever want to play this game it will be via DVD ROM on a pc with internet switched off just in case. SHOCKING!!!!!!!! This game has turned into advert central. Same adverts cropping up once every minute, very frustrating. There's honestly more clicking on Xs within adverts or on purchase offers than actual game play. Terrible. Why so many ADVERTISEMENTS? I love Angry Birds, but it’s SO frustrating waiting through the repeated 30 second game adverts. It’s ruining a very enjoyable game. But of course you don’t care, so long as the advertisers pay. Developers have lost their way and become greedy. Used to be s great game in the last but not now, patchy control, constant crappy videos promoting other games and constant requests to buy coins. Such a shame as I used to love this game, pure greed and poor quality of software and no respect for long standing customers. AVOID! I used to have this game on an older device many moons ago and it was fantastic! Provided hours and hours of entertainment due to its fun, addictive and at times, frustrating nature lol 5* game easy. I decided to download it again recently and I must say I could not be more disappointed. The game has been ruined by the developers being greedy!!! They have added all these silly little features like ‘user aids’ (which of course can be purchased) and ‘star rating to unlock new levels’ and, oh yeah, worst of all, ‘ADVERTISEMENTS’. I’m sure there are probably more terrible features like this which have been added but I honestly couldn’t play the game anymore. So frustrated after about half an hour that I had to stop. I must say that I was deceived by the title. This is not angry birds classic. This is angry birds modified. And unfortunately, modified for the worse. Bring back the old game which was so simple and loved by all!!! Just simply firing birds at pigs... that’s it! YOU MAKE ENOUGH MONEY FROM MERCHANDISE OUTSIDE OF THE GAME... DON’T RUIN THE THING THAT STARTED IT ALL OFF FOR YOU!!! I can’t play mighty league, please get it sorted. I’m having withdrawal symptoms. Angry Birds in the past was a great game and most of all FUN. Now ruined with so many adverts. Shame on you. Very good for babies who always watch there older brother or sister playing a game and they want to play👨‍👩‍👧‍👦👼🏻. Angery birds is fun game it’s fun to play when board. Better than the newer version! This app has got too many adverts, but it's so much better than the new version! Angry Birds 2 has things flying in from all over the place, extras that I don't understand and too much information on the screen all at once. Angry Birds classic is so much more enjoyable - it's symple and I know what's happening. Tried to play Mighty League as per usual, and found the internet connection times out. Can play all the other games on it, just not this. Come on Rovio, look after your existing customers and sort out this major problem. There are a lot of others who are also frustrated by this. Now just full of adverts. I paid for this when it first came out. There was the paid and the free version. Why do I have to watch adverts in a game I’ve paid for! Deleted now. Updated the app a few days ago and haven't been able to open the mighty league since! Usual story with rovio updates tbh. Since the latest update 4 days ago I have been unable to access Angey League it sticks on Collecting Blocks then times out and tells me I have no internet connection when i have a strong signal. Sort it out or I’ll be sending a mighty eagle your way ! The Mighty League does not load properly after the update. Box comes up saying it doesn’t have access to the internet. Oh dear! The latest update (1 Nov 2018) has broken the internet connection when trying to play Mighty League. I tried several WiFi networks, 4G, and several rebooting of the phone and still get an error message that there is no internet connection. Paid for this when it first came out, loved it - re-downloaded recently to find it’s riddled with ads... what the hell did I pay for? It’s now free to play so sure, give free users ads, but c’mon... after every retry of a level? That’s so scummy, you know people will attempt over and over to get 3 stars. What’s up Rovio, not making enough money? Why don’t you just run loads of ads that no one wants over a game you’ve ruined, that doesn’t work, to line your own pockets... take a bow, you’re now morally bankrupt. Came back to replay the original classic after many years and like all rovio games now, it’s absolutely inundated with ads, greed and desperation. You really sold your company’s soul to capitalism. What a ruined game. This would be a great game if it wasn’t for the continuous crashing of the app! This generally happens when you use a power up that you pay for or have earned meaning when it crashes you lose your power up and can complete the level! Very very frustrating. What’s wrong with the mighty league part of this game? It constantly crashes!! Also far too expensive to play Bye!!! You need to watch an ad or invited to play a mini game elsewhere constantly, every time between games and the crash the app all the time. I deleting this app after the review. That's it.Crashes. Lucky to get a couple of plays,then it crashes. Edit 27/08:Updated today,it *still* crashes when ads start.Are you going to sort this out please? Way too many ads Constantly crashing Can’t play the levels due to new star system WAY TOO MANY ADS!!! The game crashes after every completed level. I ve noticed this have a problem with black screen appeared several time on start up and during the game . I think that have debug . Can you resolve this issues ASAP? The makers of this game are the greediest human beings on the planet and should work for EA. A good game ruined by advert after advert. Gone are the days of simply restarting a level with two button presses. You must now navigate fields of adverts to simply restart a level. GREED GREED GREED. The ads are way too long, it’s so frustrating when your just playing the game to pass time and when you want a power-up and decide to watch to ad to obtain it it’s like 2 minutes long! I downloaded it and had paid for it some time ago. The app just bombards you every minute with advertisements for Candy Crush. There is no way to remove the adverts. Would also suggest to keep your kids away from this app. 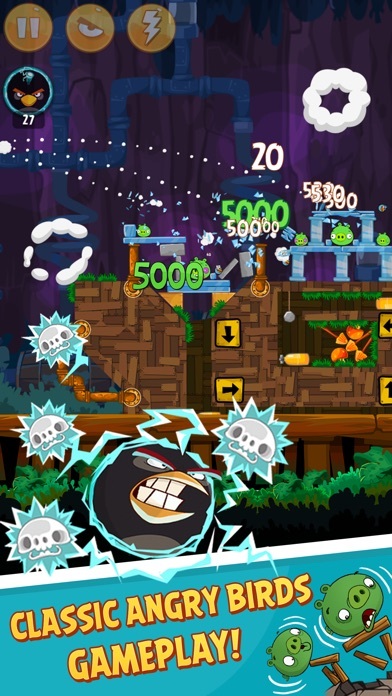 This is supposed to be Angry Birds, but the latest updates have made it more Angry Consumer... I redownloaded this after a year or so, having completed all the levels a couple of times over. I couldn’t be more disappointed. Completed the first set of levels and already feel like giving up. the stars system to unlock levels is ridiculous. You have so many games, so much money and so many micro transactions in your franchise, yet in the original game you have decided to RUIN it by forcing people to play online, and therefore needing to buy tickets to play online, just to complete the original levels. It’s an insult and the developers should be ashamed. IF YOU HAVE ANY SENSE AND RESPECT THOSE WHO MAKE YOUR GAMES POSSIBLE THEN YOU WILL REMOVE THE BS LEVEL UNLOCK SYSTEM!!! This used to be a great game, but even with the fully paid up version there’s constant ads popping up all over the place. When my first son was young he played the original angry birds for hours before all the ads, but my second son now can’t play for more than a few minutes without accidentally clicking an ad and being taken to a payment window. You are encouraged to spend money constantly when playing this game and now I’m deleting all angry birds games off my phone because I’m just so sick of having my phone shoved in my face every 2 minutes because my son has pressed another advert and doesn’t know how to get back to the game. It’s borderline unplayable now, just like angry birds 2 and pretty much every other game in the franchise. Needs an update desperately! Annoyed player! I liked playing angry birds as a kid(not so much), anyway, I downloaded it again and it started off well, although I remembered most of the levels. But the last update sometime in Early/mid March 2018 has screwed the game all over! I can’t click on my trophy to view my stickers! And every time I use a powerup, the game is stuck and it kicks me out to reload, so I end up wasting my power ups and not get any score! Very annoying as I only play one game at a time, so may be time to say bye to Angry birds again unless you fix these simple issues!!! Edited - deleted this app after the game continued to get stuck in every level in the master league, especially when I use a power up! i love this game, have done for years. I was so pleased to find it available to play on iphone. But, it constantly crashes doesnt give tickets for mighty league despite shutting it down rebooting phone, rebooting wifi blah blah, ive completely deleted and reinstalled three times it starts to load then bam it just crashes. It works fine on 3g its on wifi the problem happens, which because of the ads loading i dont want to use my data up playing on 3g but you have to be online to play mighty league. The game keeps freezing every 10 to 15 minutes of playing which causes me to go to home screen and wait a while, it particularly happens in the mighty league. Although I do not mind the ads and videos and I love playing a small trial of the game after the video has ended. Occasionally a Lego pop up ad comes up and causes you to back to the IPhone screen which means less time to play the game. I hope you can fix these issues as soon as possible. Great game! But crash bug please fix!!! Brilliant to be back on Angry Birds again. The star system is not a problem, it makes the game more challenging and more fun to play. 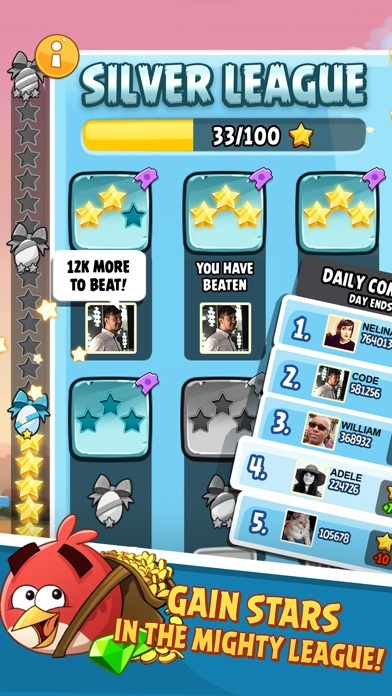 You do not have to play Mighty League, just go back and get 3 stars on the levels you’ve already completed. But please please please update and fix the awful crashing that occurs constantly!! Defo 5 stars if it were not for that. I’ve no idea how one of the greatest mobile games created has managed to become so riddled with bugs that it crashes after playing a few levels of the mighty league. Don’t get me wrong, for under £1 this was a bargain but now that the game is full of micropayments, buying objects that are lost when the game craps out is just painful and unfair. 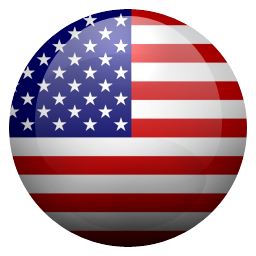 Is there regression testing prior to release? Are there real world tests? Come on Rovio! And yes, I’ve followed all the support advice many times to no avail. Make the game great again. Please. For those who have actually paid for this and some of the earlier expansions- why plague us with adverts? The game has been totally ruined by these gems and coins and has ruined an original game. Provide an option to hide all of these "features" and return the game to its classic as it once was. Better still take them out altogether and put them into one of the other spinoffs to improve the app's reliability. Game is barely playable on an iPhone 6 Plus. It's not even that old of a device. Used to love this game - played it years ago, and decided to download it again after feeling nostalgic. I know nothing is ever like you remember but this is just awful. This big stupid cartoon hand keeps appearing to show me the zoom-in motion - like yeah, sure, there could be new users who don’t know this yet, ok - so I make the motion to get this tutorial crap out of the way... but you know what happens? Absolutely bloody nothing. It doesn’t do anything, but the hand keeps coming up and getting in the way, literally every three seconds, telling me to zoom in even though I don’t want or need to, and it won’t go away. I remember this game running smoothly and without issue like 8 years ago, but now it’s clunky and generally unpleasant. I quit after three levels, feeling generally frustrated with the whole experience. Yikes. Constant crashes, often won’t even load, Master League rendered a disaster. Of course, it didn’t use to be like this, so it’s difficult to conclude that this is anything but deliberate. Why do I get the feeling that Rovio have chosen to trash this game, perhaps to get us to move on to something perhaps more lucrative to them? Well, maybe Rovio, us customers will view this is an example of your QC and approach to customer care and not trust you to be able to deliver on anything else. I know that’s now my approach. Existing customer outta here. Please remove the feature in which you have to unlock episodes with stars. Not everyone wants to play mighty league. I am very frustrated as I started replaying this game after ages and it had gone 7 years without having to unlock the levels and 2 days after I start playing again this happens. Forcing players to play mighty league is annoying. Change it back and let us normal players play through the levels like it always has been. I had this game on my phone a few years back and really enjoyed it. I stumbled upon it again last week (along with Bad Piggies) and re-downloaded it, but both games are now so riddled with pop up ads appearing very frequently (that you also can’t close) that this destroys any enjoyment of the game. The developer should take a look at how other people do ad content so much better (e.g. SimCity Buildit) Have now deleted both games from my device. I understand that the price for playing for free is ads. Annoyingly 99% of them are for games I’ve already downloaded. The Lego advert I have never seen, the logo pops up and the app crashes. It randomly crashes at any point while playing anyway, I don’t think I’ve managed to play more than five minutes. Useless. Which is such a shame as I loved the old version! 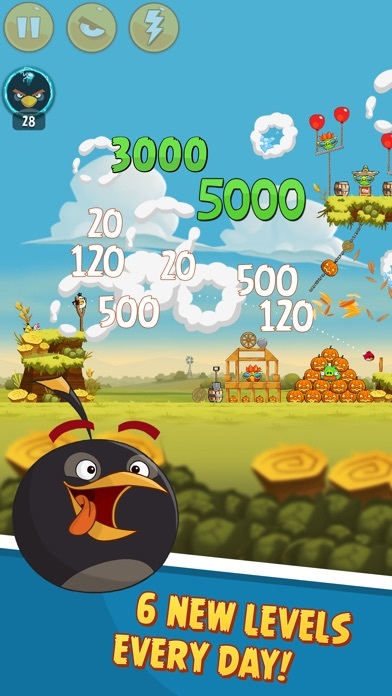 Enjoy angry birds and wade through the ads to gather more coins to buy power ups. Lately when you touch the “play ad” to get the coins you’ve earned for completing a game it freezes, turns grey and you lose the opportunity to gather more coins. Please fix this new bug. Thanks. Open the game to play and it crashes! Been playing this for years with no problems, can't do anything now! I had high hopes that the latest update would stop the continual crashes from the loading screen. Despite rebooting, it still crashes. So frustrating! Four or five restarts every time. What was my favourite game is now not so favourite! This is a very very addictive and fun game. However the game crashes constantly. I’ve tried deleting it and reinstalling it as the site recommends but I lost all of my game data. I wouldn’t mind as much if it fixed the problem, It did not. Much to be improved on. It’s a great game but it constantly crashes. Annoying when you’ve wasted money on power ups or you’ve achieved a high score. It persistently crashes every three or four levels when it forces you to watch an advert. UPDATE. It now crashes on every level. You seriously need to sort this out. It’s a good game and I enjoy it very much, however whenever I try and access the stickers or the worldwide part of the mighty league I am kicked out of the game and sent to the home screen. Can someone please get this fixed ASAP?! I’m used to updates for many apps. But really! Update of this version sometimes gives me NO sound! Crashes on loading! A company such as Rovio now has great expectations! Let down on this instance. I used to be a A.B. fan, recently came back and now I’m deleting once again! Good night and good riddance to a beautiful but ruined game! Why did you do this I played this game again from 5 years and I preferred it then it was more fun and not having online stuff. I don’t think that the levels are better and probably easier come on why are you doing:(? Loved playing this game, however the latest version is plagued by crashing making it extremely frustrating. It also takes 2 or 3 attempts to open it without it crashing. Please fix these bugs. Am a big Angry Birds fan BUT it keeps stalling. Especially frustrating when using power ups which you have to “pay” for and then lose. Please sort this out. This game keeps freezing !!! Then when I opt for the super sling the screen goes black and the only way to get the game back is to switch off my phone and reboot !!! Not happy , and it happens a lot !! !